You’ve had a long and tiring day. You come home and all you want to do is get some food and crash. But wait! What about that makeup you put on this morning? People say you should take off your makeup every night, but you absolutely do not have the energy to even wash your face. We understand that it may not seem really important. However, leaving your makeup on can lead to a variety of problems. Let’s look at the issues that can occur simply from not removing your eye makeup. Eyelash root infection and thin lashes – Have you ever woken up with swollen, red eyes, particularly near the eyelashes? You may have an infection in the roots of your eyelashes. This kind of infection occurs due to poor hygiene, including not washing your face before going to bed. It can lead to the shedding of your eyelashes, which makes your lashes look thinner and lose volume. Rapid skin aging – The skin is exposed to oxidative stress, which you can prevent by removing any free radicals settled on the skin. Otherwise, these bacteria can break down the collagen over time, causing early appearances of wrinkles and fine lines. Irritated eyes – There is a 100% chance that tiny particles of your makeup, mascara or eyeliner will find their way into the insides of your eyes. These foreign particles can irritate your eyes and cause redness in and around your eyes. Cysts – Cysts are generally non-cancerous and have a pouch-like structure that contains gas, pus or fluid. It is caused by clogged skin pores. This is something that needs a doctor’s assistance to get rid of it. Blockage in nutrient absorption – When you do not remove your makeup, you reduce your skin’s ability to absorb nutrients and moisture when you try to cleanse it the following morning or the end of the day. Hordeolum or stye – A stye is a bacterial infection that happens in the oil gland on the eyelid when the glands are blocked. It looks like a red bump on the eyelid. This can even lead to eye complications such as irritation of the cornea and cosmetic deformity, which usually requires a surgical procedure to repair. 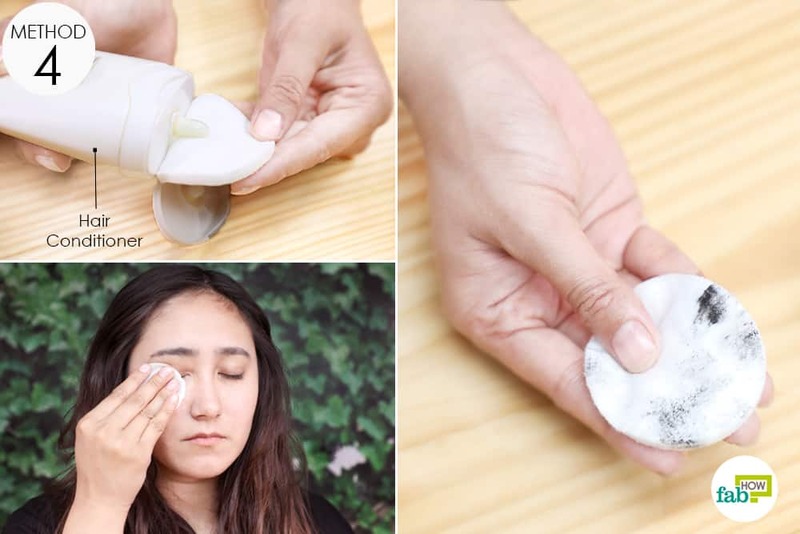 We know that these issues can be a little overwhelming, but the hard truth is that these problems are quite real and can happen if you are forgetful or skip removing your makeup even for just one evening. However, there are some quick fixes available right in your home and even some DIY homemade eye makeup remover recipes that can save you from making the long haul to the bathroom and washing your face off to remove that stubborn mascara. Single-Step Method: Squeeze a little bit of baby lotion onto your fingers and massage it on the eyes. Wipe the smudge off. It is one of the most inexpensive and easy-to-reach options that you can keep on your bedside table. You have an added advantage if you have a young child at home. Baby shampoo has milder surfactants than adult shampoos. Hence, it is easy on the eyes. It is made to be tear-free, as it can get into the infant's eyes and sting them. 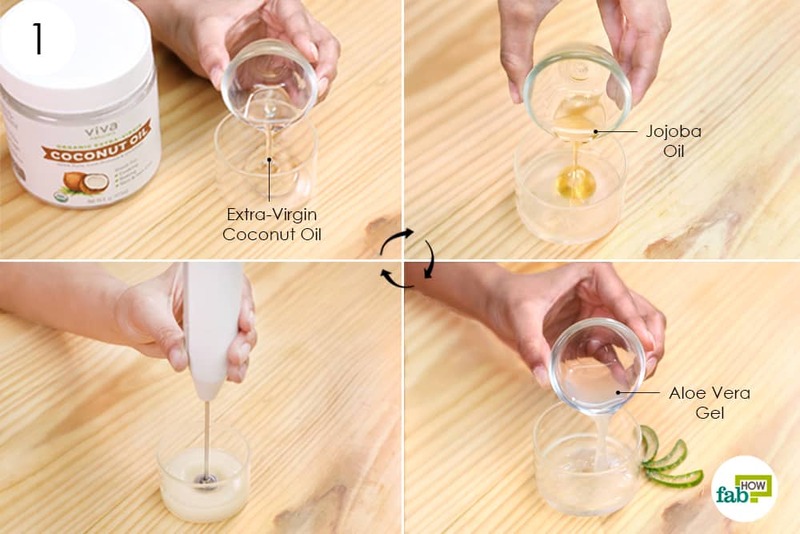 It is gentler than soap and other makeup removers, even though it is not 100% natural. Wet your eyes with water. 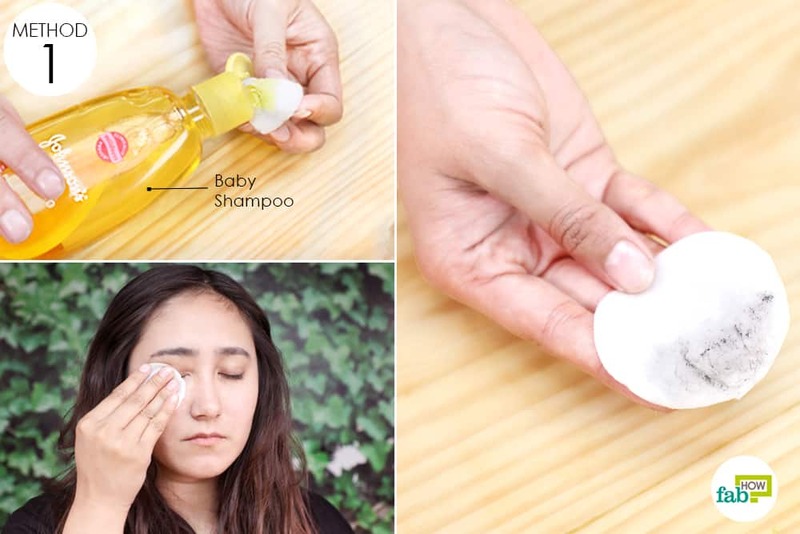 Dab a small drop of baby shampoo onto cotton ball or pad. 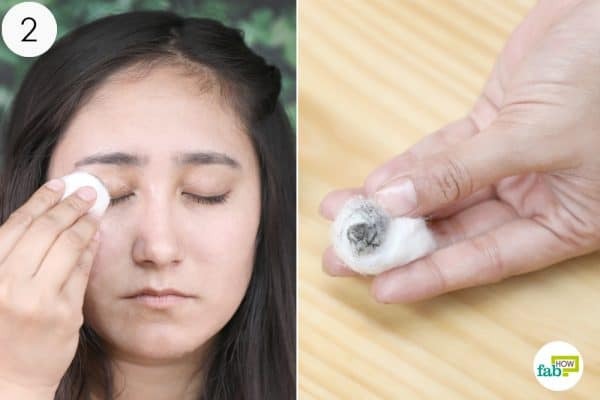 Gently wipe your eyelids and the surrounding area with the cotton pad. Wipe it from the inner edge of the eye moving outward. Massage your eyelids with the cotton pad or ball if your mascara or eyeliner doesn’t come off on the first go. One of the best ways to clear off your eye makeup is by using a lubricant, such as oil. It separates the dry and rough layer of mascara and other eye makeup, softening it for easy removal. Also, how can we ignore the nourishment and strength that oil can provide for a long, healthy and voluminous pair of eyelashes? Put 1 or 2 drops of extra-virgin coconut oil on a cotton pad. Massage it directly over the eyelids, wiping off the mascara or any other eye makeup. This recipe consists of aloe vera gel which is anti-inflammatory and will sooth the delicate skin under your eyes. The jojoba oil contains high amounts of ceramides which help create a powerful barrier against moisture loss, allergens, and dust pollutions. 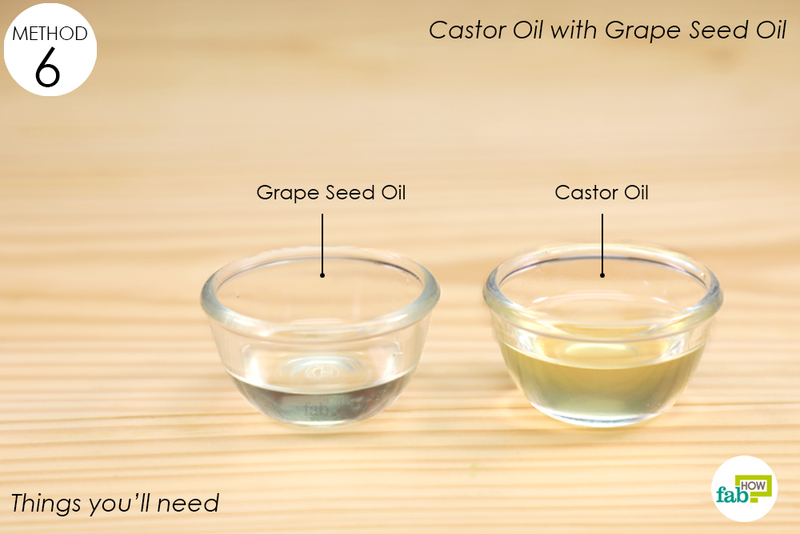 You can replace jojoba oil with castor oil as well, as it helps grow thick and long eyelashes. 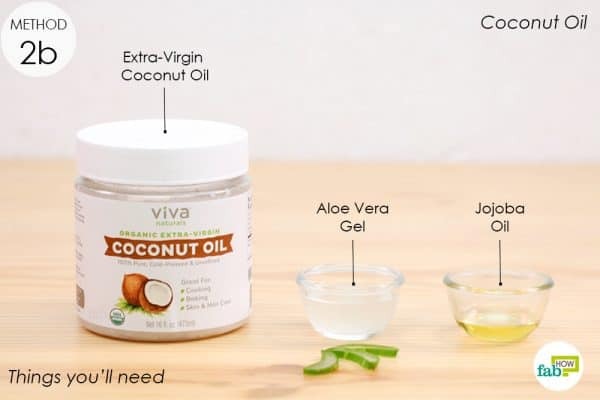 Microwave ½ tablespoon of coconut oil until it melts. Add ½ tablespoon of castor or jojoba oil to it. Add 1½ tablespoons of freshly extracted aloe vera gel to the bowl. Transfer the contents of the bowl into a small container with a lid. Store it in a cool and dry place. Gently rub the salve over your closed eyes. 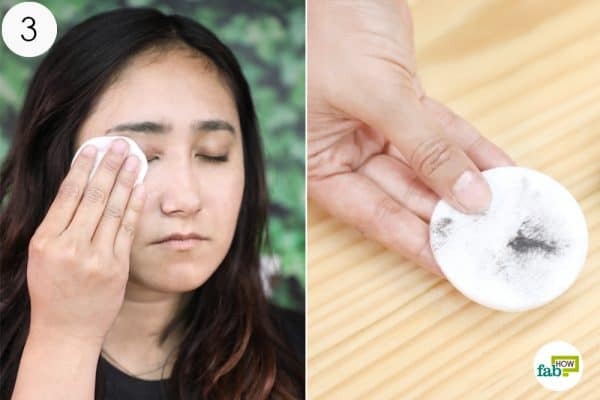 Wipe off the smudged makeup with cotton pads. 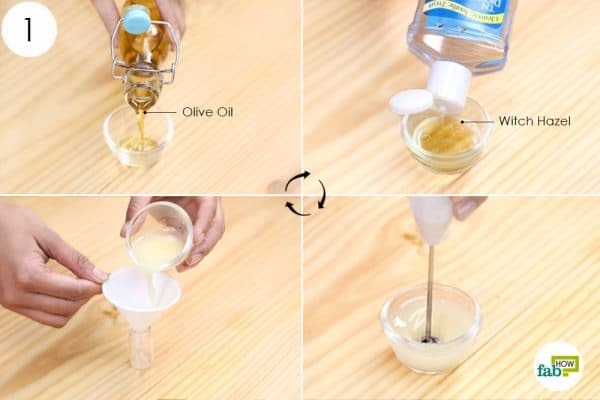 This method of DIY eye makeup remover contains olive oil. It is known to moisturize your skin and get rid of dark circles near and around your eyes. Olive oil would make your eyes look spotless – even without makeup. It contains healthy fats, which makes the skin soft and supple and preps it up for a fresh look each morning. Witch hazel is good for keeping wrinkles at bay since it is a natural astringent and makes your skin look smooth and wrinkle-free. 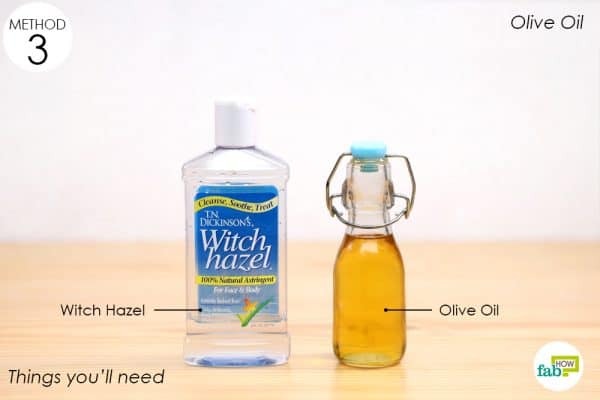 Put 2 tablespoons each of olive oil and witch hazel in a bowl. Transfer it to a reusable container with a lid or cork. 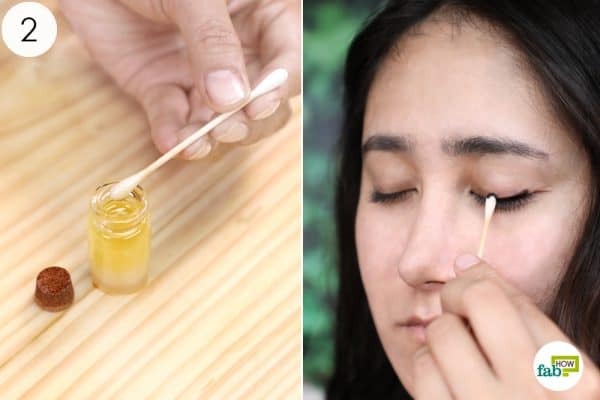 Dip a cotton swab or cotton pad/ball into the blend. Massage it on your eyes and wipe off the makeup. The conditioner is the oddest of things that you might think of using on your skin, but they work great for the last-minute makeup-removing ritual before bedtime. Since it is greasy in nature but not oily, it makes a perfect cleanser and moisturizer for your eyelashes and eyebrows. Some people have even claimed that it made their eyelashes longer and voluminous. 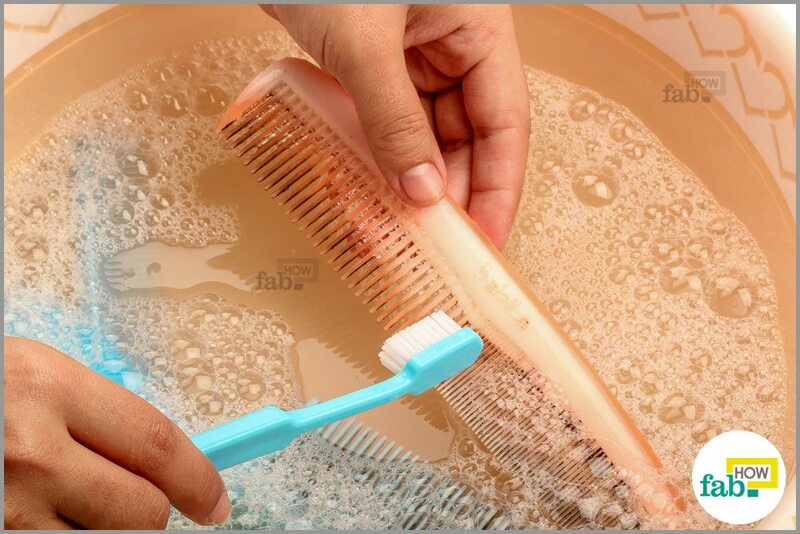 Put 1 or 2 drops of hair conditioner on a cotton pad or ball. Slide it across your closed eyes, from the inner edges outward. Repeat if needed to remove all of your makeup. Like the baby shampoo, baby lotions are milder and gentler on the skin than many regular makeup removers. It will not irritate or sting the eyes. You can even use it in place of your moisturizer in a pinch. 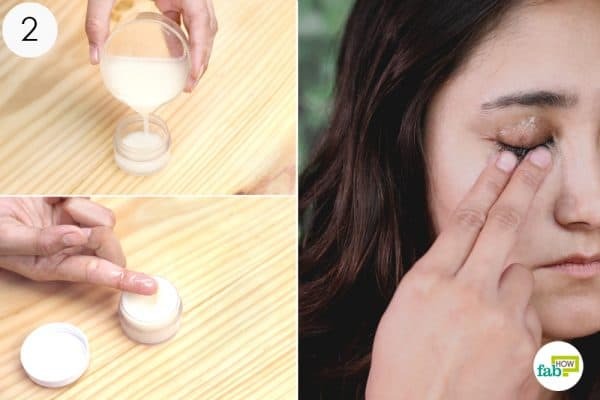 Massage a small amount of baby lotion into your eyes to break up the mascara or eyeliner. 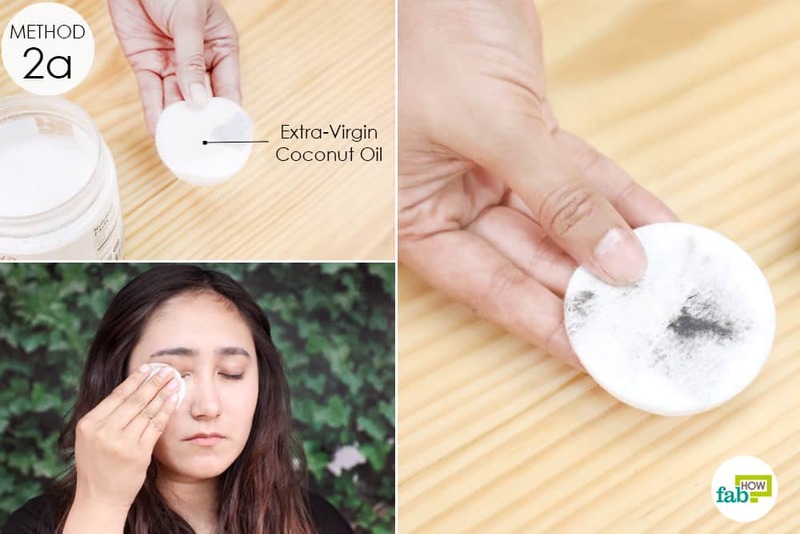 Use a cotton pad or ball to wipe off the lotion and your makeup along with it. 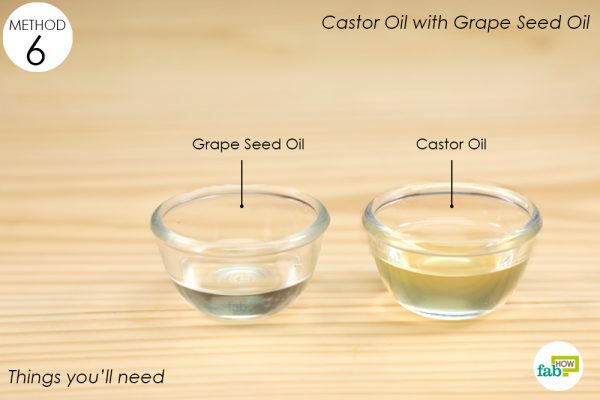 Castor oil is rich in ricinoleic acid, omega-6 and omega-9 fats, vitamin E and various other minerals that help boost hair growth by stimulating the hair follicles. It is believed that it can stimulate dead hair follicles as well. It also contains antibacterial properties, which helps in cleansing the skin. 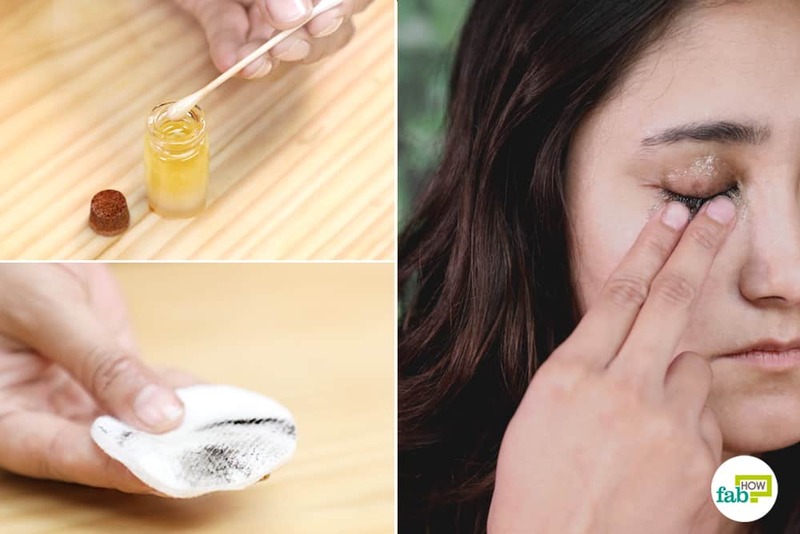 This recipe for homemade eye makeup remover also contains grape seed oil that is rich in vitamin E and is imperative for hair growth and health. It makes the hair shiny and non-greasy. 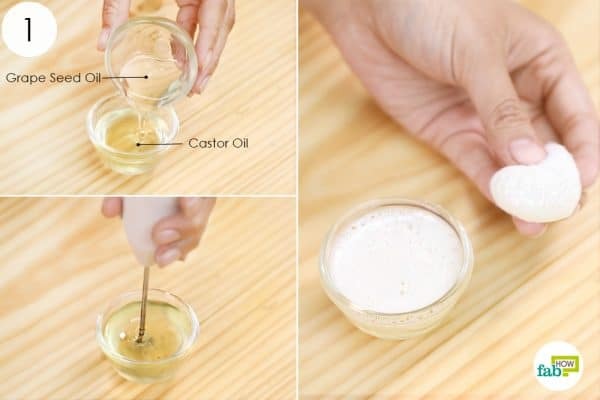 Put 1½ tablespoons of castor oil in a bowl. Add 1½ tablespoons of grapeseed oil to it. Douse a cotton ball into the oil blend. Wipe your closed eyes and the surrounding area with it. 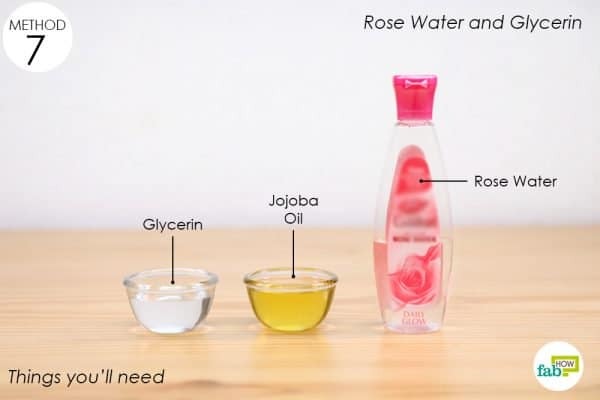 Rose water is a soothing and relaxing agent for the skin. It also acts as a toner that can close the open pores and tighten the skin. 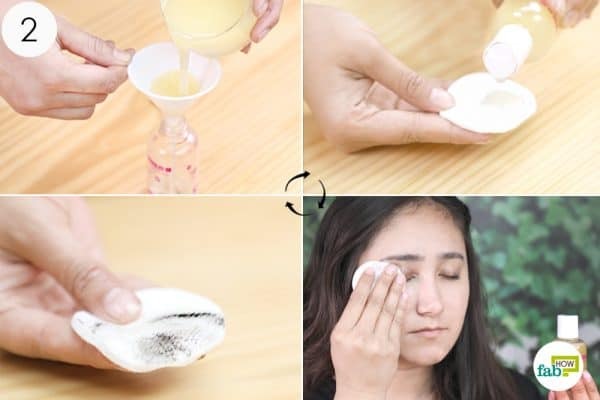 This would help in reducing the appearance of wrinkles around the eyes. 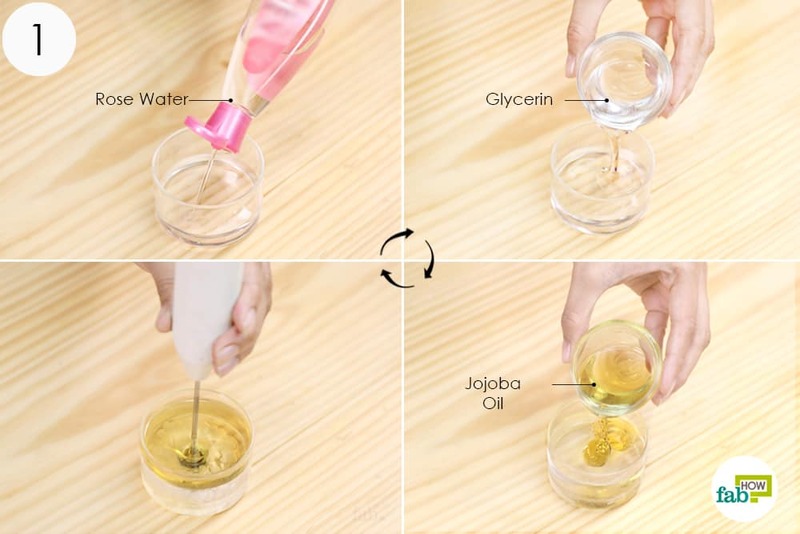 Jojoba oil and glycerin moisturize and keep the skin around the eyes hydrated. Put 2½ tablespoons of rose water, 1½ tablespoons of glycerin and 2 tablespoons of jojoba oil in a container. Transfer the whisked blend into a bottle with an easy-pour opening. Put a pea-sized amount of this salve onto a cotton ball and wipe off your makeup. Vaseline is a must in every woman’s makeup kit, be it for correcting a makeup mishap or instantly moisturizing your skin. Vaseline can quickly smoothen, soften and moisturize your skin. Applying a little bit of this onto your contoured face will give you a glossy appearance. Even though Vaseline is greasy in texture, it will never clog your pores or cause acne. Do not let Vaseline get into your eyes, as it is oil-based and will make your vision blurry for a while. If it has entered your eyes accidentally, rinse your eyes with warm water immediately. 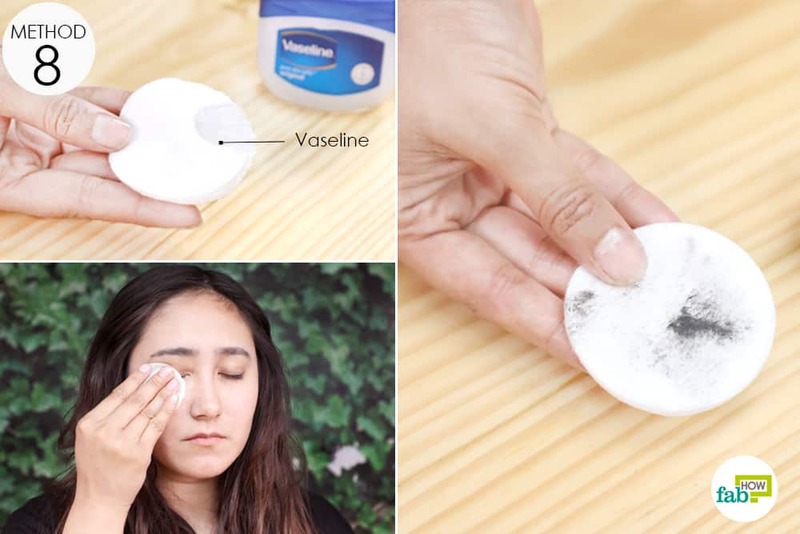 Put a pea-sized amount of Vaseline on a cotton pad or cotton ball and wipe your eye makeup off. Repeat if all the makeup doesn’t come off the first time. After removing your eye makeup, wipe your eyes with a clean and dry cotton pad to remove any excess lotion or other DIY removers. If any of the DIY removers cause discomfort after using them, rinse your eyes with normal water.